Pelamis, one of the UK's leading exponents of advanced wave power technology, went into administration in November, having failed to find enough funding to support its research and development. The demise of one of the biggest names in the field demonstrates that the leading edge is an exposed place. Can the UK hit its energy objectives of secure, affordable, low-carbon energy generation and supply? Has the government fallen out of love with renewable energy? The 2014 Budget announcement to reduce investment incentives in renewable energy – by excluding solar and wind power from Enterprise Investment Schemes – was buried away in George Osborne's Red Book. There was nothing subtle, however, about the government's decision two months later to end subsidies for new (and large) solar power plants (under the Renewables Obligation scheme) two years earlier than expected. The Department of Energy and Climate Change (DECC) announcement that the scheme will be closed to new solar projects over 5 megawatts (MW), effective 1 April 2015, not only served as a timely reminder that the government's renewables policy isn't set in stone, it also brought into sharp relief the fiscal constraints – in terms of preventing costs soaring under the scheme – under which it presently operates as it grapples with the long-standing budget deficit. The solar industry has become a victim of its own success. DECC argues – without giving specific numbers on how much has already been awarded to solar power producers under the scheme – that large-scale solar energy installations are deploying much faster than previously forecast. In plain language, the cost of subsidising the underlying technology was rising faster than originally planned and subsidies needed to be cut to ensure sufficient cash would still be available to support other types of renewable technology – and keeping a lid on consumer bills. Previous forecasts that only around 2.4-4 gigawatts (GW) of solar power capacity would need to be funded by the scheme by the end of the decade have now been torn up, and it is suggested that more than 5GW could be deployed by 2017. As part of its plans for electricity market reform, the Department is establishing the Contracts for Difference (CfD) regime to replace the Renewables Obligation. CfD offer low- carbon electricity generators an agreed price for the electricity they generate (known as the "strike price"). A newly formed Counterparty Body will pay generators the difference between the market price and the strike price for the electricity they generate, where the strike price is higher. If the market price is higher than the strike price, generators will pay the difference to the Counterparty Body. To enable it to make payments, the Counterparty Body is funded by electricity suppliers, which may pass these costs on to consumers. DECC claims the CfD regime will deliver a net economic benefit of £10.7bn (in 2012 prices) up to 2030. While solar projects will still be able to apply under the CfD rules – giving renewable power generators certainty of a minimum electricity price over 15 years – this subsidy is likely to be harder to win as the total amount available is capped and projects will be forced to compete with each other on cost in order to win the contracts. In its November 2014 report, Cost Reduction Potential of Large Scale Solar PV, the Solar Trade Association concluded that the cost of generating electricity from a typical 10MW solar farm in the UK, for example, is set to fall faster than many think over the next 15 years. Detailed analysis to calculate Levelised Cost of Electricity values compared to analysis by DECC – over the timescale 2014–2030 – were undertaken. Additionally, strike prices were modelled and compared to DECC's administrative strike prices. The headline conclusion was that the cost reduction of large- scale solar will occur more rapidly than DECC's own costs have shown: a 33 per cent drop in costs to 2020, with a further 11 per cent reduction in the period 2020–2030. While individual technology cost isn't the only consideration in developing efficient low-carbon electricity systems, this reduction would indicate that solar PV will be cheaper than gas (Combined Cycle Gas Turbine or CCGT) by 2018, five years earlier than DECC suggests. In part this can be explained by a growing solar supply chain in the UK, coupled with falling global prices for solar panels and inverters – the equipment that changes the electricity produced by panels into the kind of power used by the grid. The report also suggests solar PV (photovoltaic) will achieve "grid parity" (that is, become as cheap or cheaper than the wholesale electricity price) between 2025 and 2028. But it's quick to note that being at parity with gas doesn't mean solar wouldn't need a subsidy, given the production of electricity through CCGT costs £25/MWh more than the existing wholesale electricity price. Even fossil fuels require a subsidy. CCGT plants are also projected to increase in costs in real terms over the next 15 years, while large-scale solar is currently the only technology forecast to become cheaper than wholesale electricity. As Paul Barwell, CEO of the Solar Trade Association, puts it: "It is clear that it makes political and economic sense for the Government to back large-scale solar, with the sector's track record in creating jobs, and producing ever cheaper zero carbon power." He adds: "A lot of people still don't realise just how close solar is to being competitive with gas-fired power generation. UK solar is on its way to becoming subsidy-free, but it is critical we maintain stable government policy that supports grid connected utility-scale solar as opposed to fossil fuel power stations." "New turbine models that are more suitable to slightly lower wind speed sites...[are] opening up opportunities." The report concludes the Solar Trade Association's own (and more accurate, it claims) data should be used by DECC to update its models so it can make informed decisions on the future energy mix for the UK. "This will ensure government makes the best strategic use of constrained public resources in the interests of UK energy consumers and for achieving its carbon targets cost- effectively," the report says. "The analysis also highlights why it is in the medium and long-term interests of consumers for government to retain a stable policy framework for the large-scale solar industry." The Association's research follows a report from the Centre for Economics and Business Research showing the UK could provide enough electricity to supply 15 per cent of UK electricity demand by 2030, supporting almost 50,000 jobs. 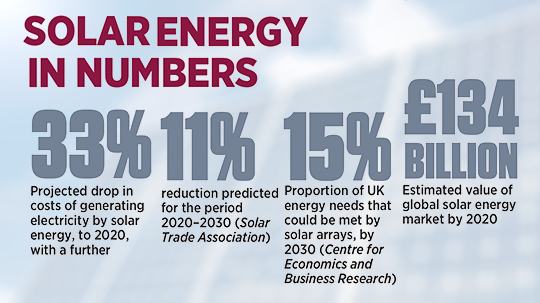 Big solar arrays alone could add more than £25bn to UK economic output. Below the 5MW threshold, the government supports renewable electricity generation under the Feed-in-Tariff(FiT) scheme. Up to 5MW, developers can choose whether to opt for the Renewables Obligation or the FiT – the choice likely to be determined by the developer and the funding model, although lower down the project scale the FiT scheme usually prevails. As RenewableUK (which champions the wind and marine industry) notes, the government in 2012 undertook a wide- ranging review of the FiT regime and introduced new support rates for small and medium scale wind. It also introduced "degression rates" – in effect step reductions in support, which are triggered when a certain amount of capacity is developed. It has expressed concern, however, that in combination the scheme is "encouraging a short-term market in which early entrants are rewarded, instead of supporting a market that builds out for the longer term." This includes growing UK manufacturing of small-scale wind systems where the UK is a world leader. Figures released in a study from a partnership project between Farmers Weekly and Nottingham Trent University, called The Farm as Power Station Project, found in 2013 that 40 per cent of UK farms were using renewable energy. Jennifer Webber, director of external affairs, at RenewableUK says that while the "low-hanging fruit" for potential small turbine sites have been exhausted, there remain plenty of opportunities for small wind development, especially where on-site use of the generated energy is taken into the equation. "Turbine manufacturers are also continually launching new turbine models that are more suitable to slightly lower wind speed sites. Endurance's new E4660 turbine and Northern Power's NPS 100C are recent examples of this movement. This is opening up opportunities for further small wind developments on previously dismissed locations," she says. Webber expects onshore wind to be the cheapest form of electricity generation in the UK by 2020. For offshore wind, the outlook is slightly harder to determine and depends on the level of government support to ensure the vital economies of scale required to bring down costs. "The industry has set a target of reducing costs of offshore wind by 30 per cent by 2020. At the small and medium scale, a number of manufacturers are confident they could achieve cost parity in the next three to four years if the cost of electricity continues at a steady rate and the turbine owner uses the generated power for on-site energy needs," she says. From a financing standpoint, Ben Warren, head of environmental finance, EY, says that for landowners, renewable energyprojectscontinuetoofferthepotentialforlong-term returns, whether by investing directly into the assets themselves, or in receiving a long-term rental income. 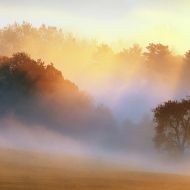 "A key consideration is whether landowners themselves are happy to take on the development risk of the project, i.e. to try and secure the necessary planning and environmental permits, and the suite of agreements to build and operate the project," he says. The scale of the problem facing the government – given the wider implications further down the foodchain–can be seen in a National Audit Office (NAO) report from June noting Britain's energy ministry awarded too much in subsidies to eight renewable energy projects in April, meaning consumers will pay over the odds for the electricity the projects produce. 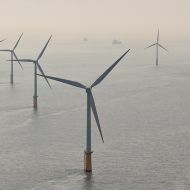 The subsidies – promised to five offshore wind farms and three biomass plants and expected to start producing electricity between late 2015 and 2019 – are worth £16.6bn, according to the NAO, and guarantee around £63 per megawatt for the projects' electricity. In the meantime, the government's Green Investment Bank has taken a £240m, 20 per cent stake in the 317MW Sheringham Shoal wind farm off the Norfolk coast – the project having been running for two years and providing enough electricity annually to power as many as 220,000 homes. The NAO report came amid mounting pressure on politicians to keep energy bills down and barely 24 hours after energy regulator Ofgem referred the retail energy market to the Competition and Markets Authority (CMA) for investigation. If the renewables industry – irrespective of the source of "clean energy" provided – is looking for "visibility" in terms of stable government policy, it is likely to be disappointed as the government takes an increasingly reactive approach, constrained as it is by wider financial issues such as reducing the budget deficit. This isn't simply an industry issue, however: consumers need to do their bit too, as PwC highlighted in its Energy Tracker 2020 report, issued in October 2014. It claims households could cut their energy bills by £400 a year by 2020 if they grasp the nettle, reducing consumption and increasing energy efficiency. The report investigates a wide range of issues affecting the UK's ability to reach its energy objectives of secure, affordable, low-carbon energy generation and supply. As Michael Timar, energy and utilities partner, PwC in Scotland, put it: "It's clear that our growing energy conundrum won't be resolved if the spotlight only shines on the role of the suppliers. Achieving secure, affordable and low-carbon energy for the future is a difficult balancing act and it is certainly a lot more complex than just supplier margins." He added: "Despite uncertainty on future energy pricing, supply and the ongoing CMA investigation of the big six energy suppliers, positive progress is being made in renewables and investment to meet the government's objectives."